Honestly, intensity is one of the biggest topics I discuss with clients when it comes to what’s missing in their workouts. I find that so many people are just “going through the motions” during daily workouts. What happens for many is that they simply get used to their routine. It’s easy to get complacent and not think about what you’re actually doing. Unfortunately, this leads to a lack of intensity and a lack of results. Working out intensely requires you to work hard. It requires you to give 100% of your energy to generate power. It requires you to dig a little deeper and find that inner strength to push yourself hard. While it might seem daunting… the results are worth it. Exercising intensely has many positives including physical and mental benefits. From getting stronger and leaner to producing feel good endorphins, exercising intensely produces rewards well beyond the actual workout. We use intense exercise in some of the workouts at our fitness retreat so guests can experience a wide range of fitness activities. One of the benefits of HIIT workouts is that because they are so intense, you can get the same benefit out of a 20 minute workout that might normally take you 40 or 45. More bang for you buck — a win win! Builds Strength - Strength gains mean a stronger body which is so important for the activities of daily living - not just for working out. Better Posture - Strength can help improve posture allowing you to enjoy the benefits of a balanced body. As you workout and build strength, your musculature will start to adjust bringing you into a better balanced state. Weight Loss - This goes back to energy in versus energy out. Weight loss isn’t always that simple for everyone as there are other factors that sometimes need to be considered but exercising intensely can provide that calorie burning boost you need to shed a few pounds. Calorie Burn During The Workout - This is kind of a no brainer. Working out hard is definitely going to burn more calories during the workout. While it’s not always all about calorie burn, it definitely helps in weight loss and weight maintenance. Post Exercise Calorie Burn - When you workout intensely, you body has what we call EPOC (excess post oxygen consumption) or the “after burn”. The after burn is an elevated metabolism stimulated by intensity. Your metabolism will run at a higher rate for a period of time even after the workout is over. Energy Boost - If you’re working out hard enough, you can get an energy boost. Reduced feelings of fatigue have been shown with regular exercise on a weekly basis. In addition, exercise can significantly increase energy levels for people suffering from chronic fatigue syndrome (CFS) and other serious illnesses. 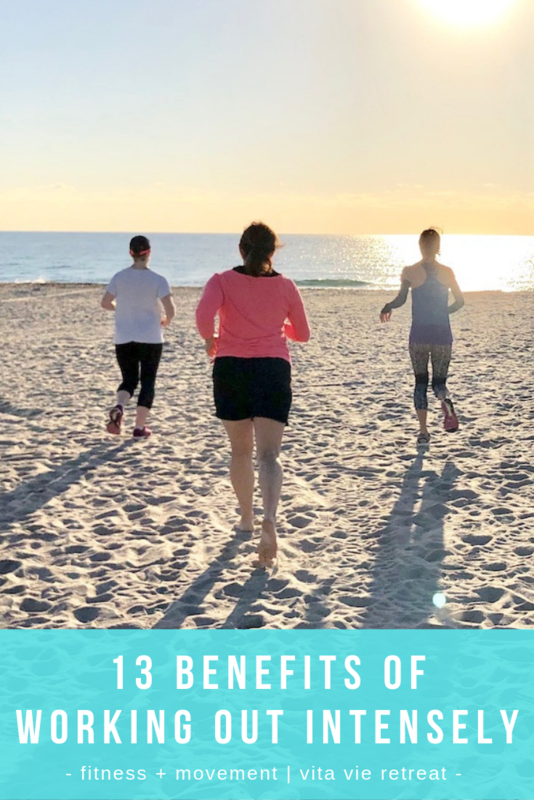 Better Endurance - Even though a lot of intense workouts are performed in short bursts, it can still boost your cardiovascular health and therefore give you better endurance. Plus, you’ll be in better shape in general which will help your body perform at a higher level no matter what kind of workout or activity you’re doing. More Power - With high intensity comes short bursts of energy that help develop your muscle tissues and your cardiovascular system to be able to generate more power in a short period of time. Think sprinting, batting, swinging and having to move in different directions very quickly. You have to train similarly to be able to perform these powerful movements. Core Strength - Your powerhouse is your core. Your core is the center of your body which houses your vital organs and supports your entire body. Think of your core as the command center for your posture and strength. A strong core not only protects your vital organs but also helps build strength and balance throughout the rest of your body. Balance and Stability - Intense exercise like running sprints, jumping and pushing and pulling will have your body moving in different directions and different ways. This type of training builds the mind body connection which helps your brain tell your body how to move. This process builds better balance, coordination and proprioception. It Can Make You Happier - Exercise produces endorphins which make you feel good. You know that exercise “high” that you feel after working out intensely? That feeling is a result of endorphins. These feel good chemicals not only help you feel happy but help regulate stress and anxiety. Glowing Skin - Yes! Exercise can help fight against oxidative stress which can help the body’s ability to produce natural antioxidants which help protect cells. In case you’re not sure where to start, here are some examples of intense workouts that you might be able to find in your local area (or come join us for a retreat!). There are also many moves you can do on your own to workout intensely like add in some sprints while you run, do jump squats instead of regular squats, add more weight to your strength workout, change the format of your body weight workout to produce a muscle burn. The options are endless! If you’re not sure where to start, join us for a fitness retreat or sign up for a personal training session to get on the right track to seeing results and reaping the benefits of intense exercise.